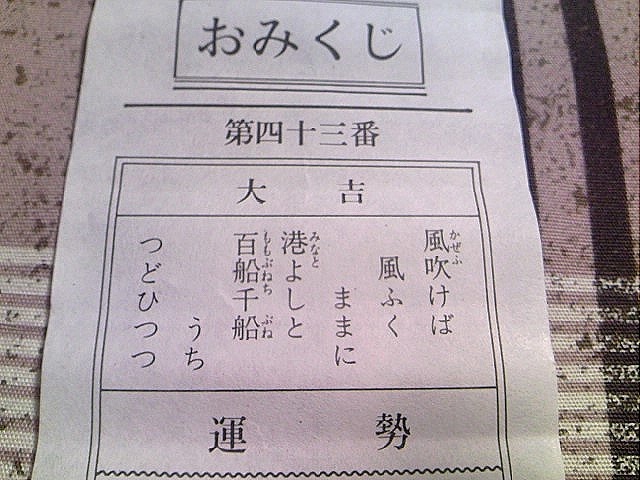 Omikuji, the paper fortune: I wish you happiness this year! Do you know the mountain on the photo? 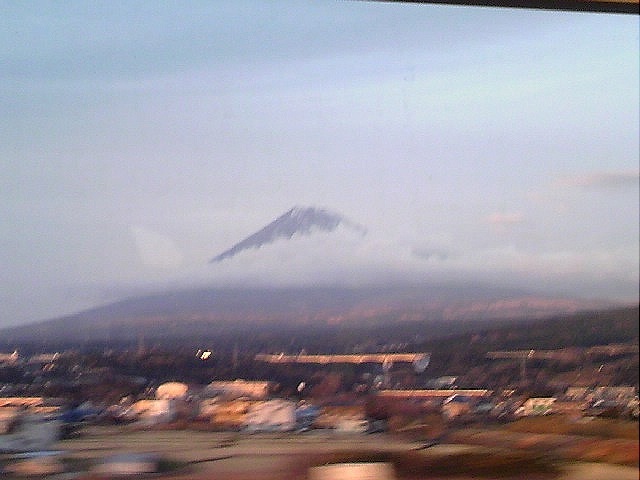 That’s Mt. Fuji, which is a symbol in Japan. It has been worshiped and loved with its beautiful shape and its height for a long time in the country. I took the photo from the window of a Shink, the train, when I came back to Nagoya from Tokyo, where I had spent a few days in New Year holidays with my family. The weather was not good and the mountain was surrounded by many gray clouds, but it looked mysteriously beautiful. I couldn’t stop wishing a better year while seeing the mountain. 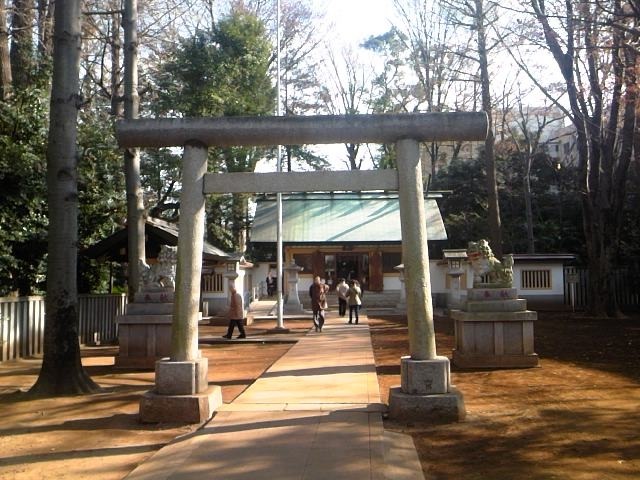 While staying in Tokyo, I visited a shrine and prayed for health of my family, friends and myself and for happiness and peace in the world. I hardly ever draw omikuji, or paper fortune, but I drew one for a change this year. Wow! The fortune says I’ll have excellent luck! It’s called “dai-kichi” in Japanese. everything goes well in the breeze. thousands of ships stay at ease. You can do anything you like, but you shouldn’t drop your guard at all. You should start to think about the next year from now not to miss anything. Wish: You can make a wish come true. You should start anything earlier. People you’re waiting for: They’ll visit you suddenly. Lost things: You’ll get the info from a man. Travel: Good but you should be wary about robbery. Business: The profit will be small. Employee: That person is nice for you. Moving: You hadn’t better decide quickly. Illness: Not serious and you’ll get well soon. Marriage: You hadn’t better to ask women for it. According to the fortune, I have to start to think about the next year although a new year has just begun! What shall I do? Anyway, this year seems to be very nice for me. I hope this year also bring much happiness to you!